Speaking of red again, here is a reddish-pink bloom from Astilbe ‘Chinensis Pumila’. So feathery soft and not at all like what a traditional bloom on a flower looks like. Another red bloom, but this time from one of the shrub roses. Another Summer-long bloomer. 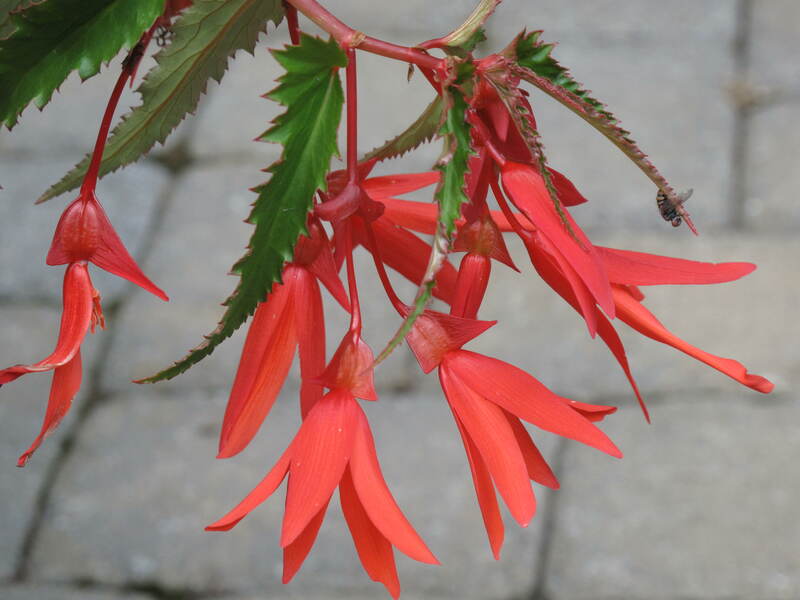 Begonia, ‘Bonfire,’ is a variety of tuberous B. boliviensis. These fiery red blooms always light up a garden or patio. Salvia’s long and tall blooms are a favorite for local bees to come investigate. Salvia’s blooms have a long staying power. Salvia plants are blooming and showing off their dark purple blooms. Another one of my ‘go to’ plants when I need something for the garden. A softer shade of lilium martagon. This one is lilium martagon ‘Mrs. R. O. Backhouse’. Quite a name, huh? The little yellow blooms of Coreopsis ‘Moonbeam’ cover my gardens right now. Each delicate little bloom pointing to the sun on a feathery stem. During our last garden tour, these roses were mere buds. Even with the high heat, these two buds had the courage to fully bloom. I love the soft pink color. That this rose was here when we moved to Glen Road always makes me have a soft spot for it when it blooms each season. So tell me, what’s blooming in your neck of the woods? This entry was posted in Gardening, Life, Nature and tagged Acorns, Beauty, Blog, Fun, Gardening, Life, Lifestyle, Love, My Life, Nature, Photos, Summer, Thoughts. Bookmark the permalink. Hi Greg. Thanks. Have been keeping close tabs on your garden as well and things seem to be doing well for you too. Thanks for the comment and hope to see you back soon.